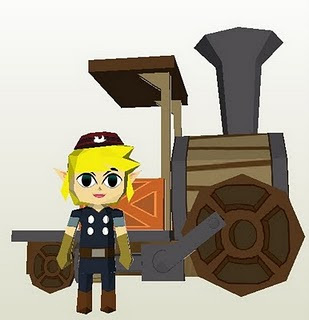 This train is from the Nintendo DS game Spirit Tracks, the fifteenth installment of the Legend of Zelda series. 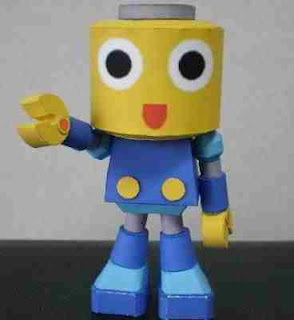 Here's a Zu-nari Type helmet papercraft from Honda Masashige. 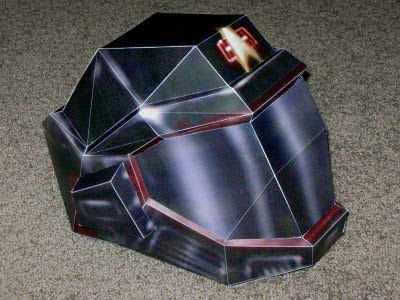 This is the helmet used by the members of the Hazard Team from the video game Star Trek: Voyager , a group tasked with protecting Voyager as repairs are made, and investigating the cause of their entrapment. 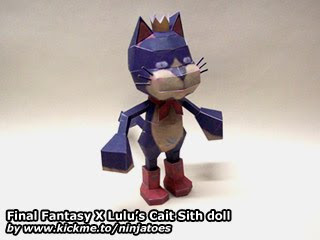 Cait Sith was one of weapons of Lulu, a black mage and one of the seven main playable characters in FFX. 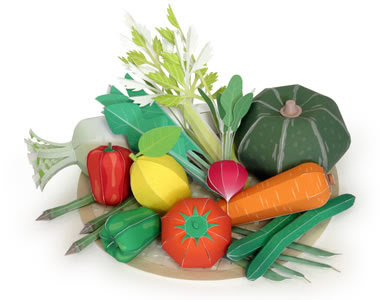 Kirin of Japan is promothing a healthy lifestyle by eating veggies. 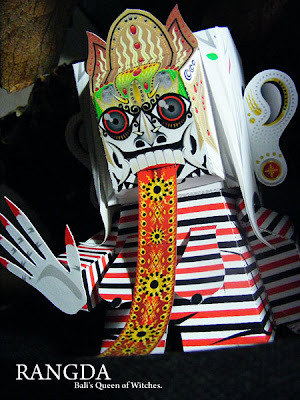 Here's a papertoy featuring a condition called bicephaly or dicephaly. 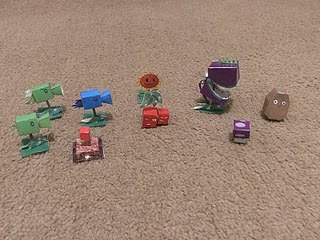 Here are the papercrafts designed by the Mad Hatter as tribute to the popular Popcap game Plants Versus Zombies. Spinarak is a dual-type Bug/Poison Pokémon that evolves into Ariados. 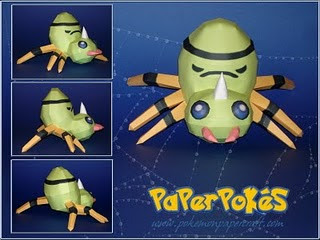 A Spinarak closely resembles a spider but with only six legs. The spots on Spinarak's abdomen resemble a face. The "face" on Spinarak's abdomen is actually capable of changing its expression to suit Spinarak's mood. Arakune is one of the characters from the HD 2D fighting game BlazBlue. Arakune is an occult being that is constantly seeking knowledge. Its body consists of a mask-like face and an amorphous black and red body, which houses innumerable insects. Currently, it lives under the streets of Kagutsuchi. Because it needs to absorb large amounts of life force to continue its existence, it frequently attacks those of the Kaka tribe and humans alike. 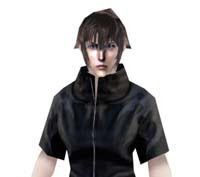 Noctis Lucis Caelum, nicknamed Noct, will be a playable character and the protagonist of the upcoming game Final Fantasy Versus XIII for the PS3. He is a prince, the last heir to a dynasty ruling over the last kingdom to control crystals, and from his throne, defends his kingdom from marauders and barbarians who seek to conquer the city and claim the crystals by force. 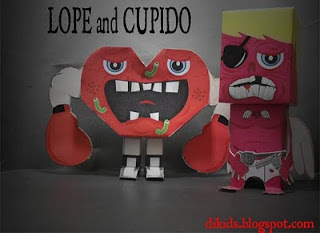 Check out this dumpy papertoy custom by Filippo Perin aka Philtoys from ITALY. 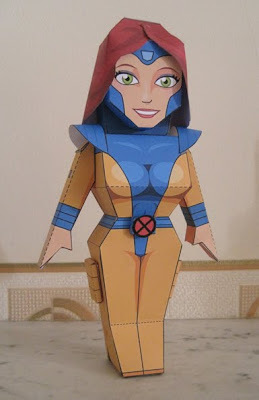 Here's a quick follow-up to the Jean Grey papercraft I posted. 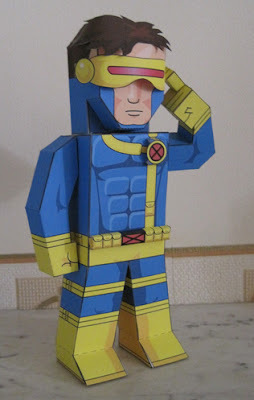 Cyclops is a member of the X-Men and the partner of Jean. Jean Grey-Summers is one of five original members of the X-Men and the husband of Cyclops. Litchi is a character in the video game BlazBlue. She is an oriental doctor who runs a health clinic in Kagutsuchi while she searches for a way to help Arakune revert to his formal self. 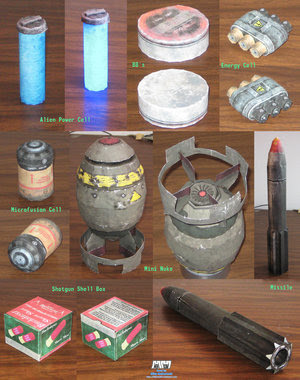 Here's a whole bunch of weapons from American Alice McGee. 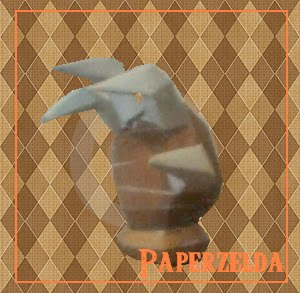 The Mole Mitts are an item from The Legend of Zelda: The Minish Cap. 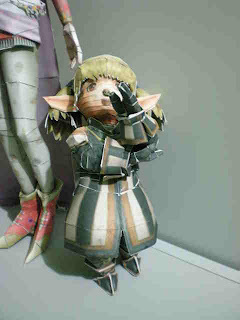 They are gloves shaped like the hands of a mole, that allow Link to dig his way through loose walls or into the ground, in this respect functioning the same way as the shovel does in other games. 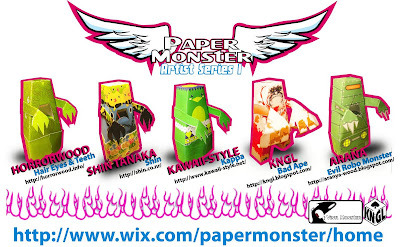 The first Paper Monster series is out!!! 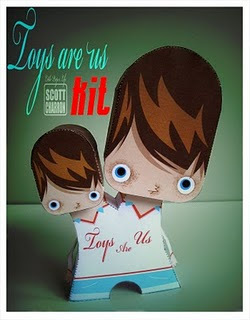 Featuring papertoys customized by big artists like Horrorwood, Shin Tanaka, Kawaii-Style and Arana Wood! 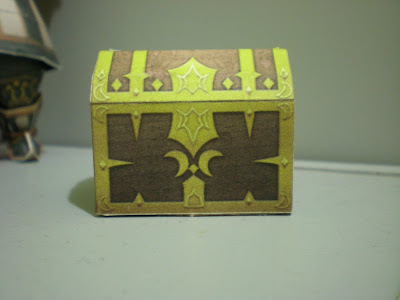 Here's a pretty simple treasure chest from Dissidia: Final Fantasy, an action RPG/fighting game developed and published by Square Enix for the PlayStation Portable (PSP). 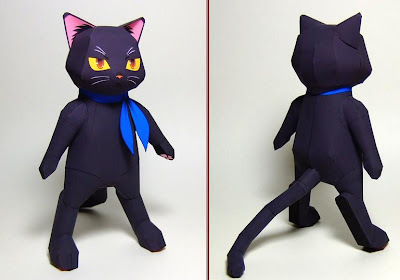 This cat looks familiar though I'm quite not sure as to what anime series it is from. Tifa Lockhart is a female protagonist in Final Fantasy VII and Cloud's childhood friend from Nibelheim. She's also a member of AVALANCHE. 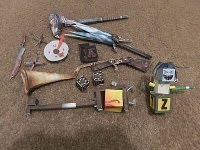 Mike is back with a bunch of models from the Fallout 3 video game. 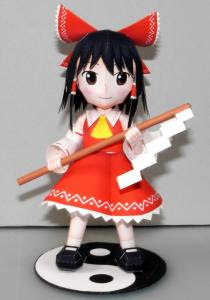 Reimu Hakurei is one of the main characters of the Touhou video game series. As the sole maiden of the Hakurei Shrine, she is commonly called upon (or calls it upon herself) to investigate strange occurrences throughout the world. After receiving V2 rocket plans, plutonium, and uranium oxide snuck into Japan by German U-boat No.234, the Imperial Japanese applied their new technology to the pre-existing Cherry Blossom kamikaze plane. This new jet was to function as a human piloted atomic bomb to be deployed from bombers during the defense of Japan. 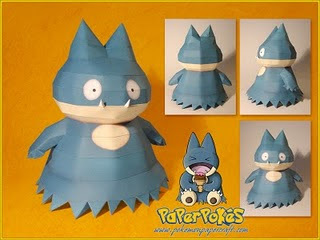 Munchlax is a Normal-type baby Pokémon that evolves into Snorlax. It was the first Generation IV Pokémon to be revealed to the public, in May 2004. 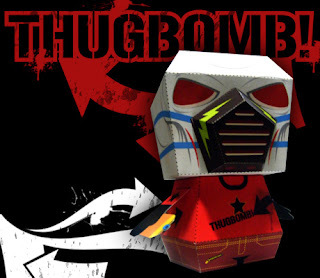 Thug Bomb papercraft was inspired by BOMB IT!, an international graffiti and street art documentary filmed on 5 continents. It explores the interplay between worldwide graffiti movements, the global proliferation of "Quality of Life" laws, and the fight for control over public space. 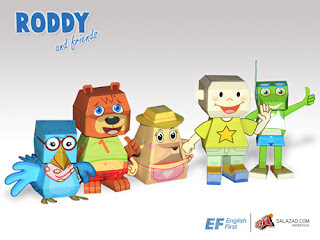 Roddy and friends are characters created by EF, which is used to facilitate the children in learning English. 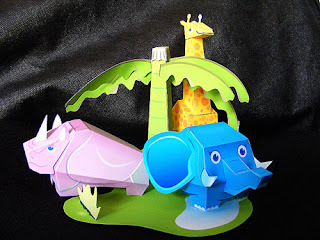 Create this very cute diorama papercraft featuring an elephant, a giraffe and a Rhino. 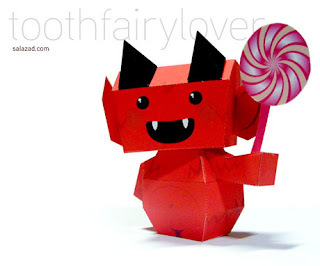 The Tooth Fairy is a mythical character depicted as a fairy that gives a child money or gifts in exchange for a baby tooth that has fallen out. Children typically place the tooth under their pillow at night. 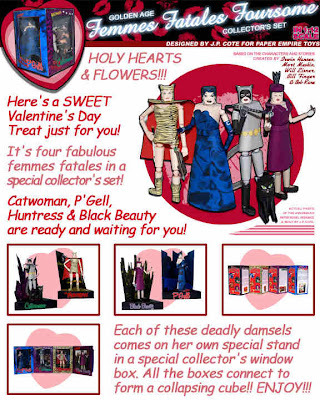 Check out these two papercrafts for the Valentines from Dikids. The White Sword is the second most powerful sword Link can wield. It is held by an Old Man who lives in a cave above the Waterfall. 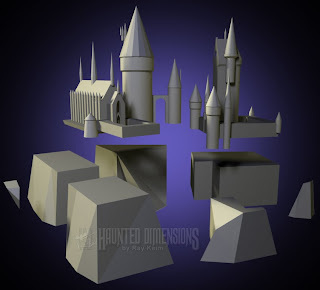 We just got a word from Ray Keim that he is working on the Hogwarts Castle facade from the "The Wizarding World of Harry Potter" that is about to open at Universal, Orlando. 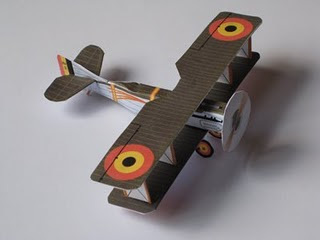 There's still no definite date as to when he'll be able to finish the model so in the mean time, be sure to check out his site for his other exceptional paper models. Pocoyo (Pocoyó in Spanish) is a Spanish pre-school animated cartoon series created by David Cantolla, Luis Gallego and Guillermo García Carsi of Spain. It is about a young boy dressed in blue, who is full of curiosity. Viewers are encouraged to recognise situations that Pocoyo is in, and things that are going on with or around him. Each character has its own distinctive dance, and most episodes end with the characters dancing. This one was taken from the movie final Fantasy Advent children. 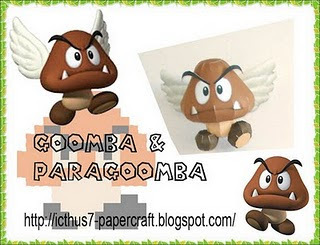 Paragoombas, also known as Winged Goombas, are a variety of Goomba that possess small wings protruding from either their head or torso. This version was taken from The Nintendo DS' Super Princess Peach. 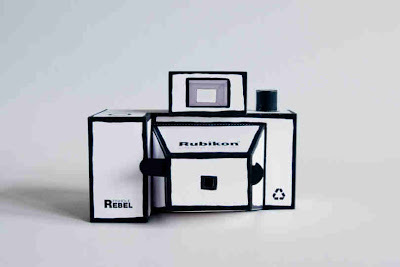 "Rubikon is a cut-out, which becomes a functioning camera (camera obscura) after putting together. In 1979 the ABC magazine published a jigsaw called Dirkon, which paraphrased the at that time very popular single-lensed reflex cameras. Rubikon, as a redesign has come back to react to the digital techno." 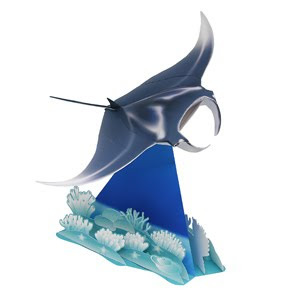 This one was designed by Jaroslav Juřica. Exdeath, also known as X-Death or ExDeath, is the main antagonist of Final Fantasy V. According to Ghido, despite his knightly appearance, Exdeath was once, and still is to an extent, a tree from the Great Forest of Moore. Anyone hungry? Try out this green pepper and black olive pizza. 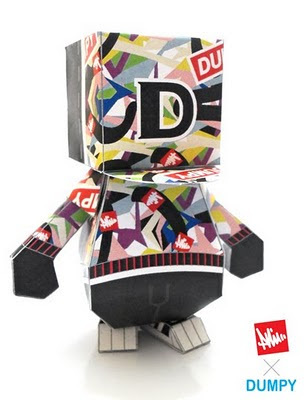 Lika is Paper Replika's new mascot. She is wearing this cute costume to celebrate the Year of Tiger. She is the 99th model released by Julius. 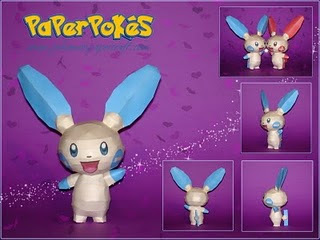 Plusle is an Electric-type Pokémon. Plusle bears a remarkable resemblance to Pichu and Pikachu. 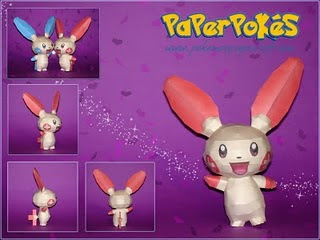 Plusle are mostly a shade of cream with red accentuation. The accentuation of red are apparent on its large ears, cheeks, forepaws, and tails. Plusle's short tails have flat plus signs on the end of them, while their red cheeks are circular with plus signs voided in the middle. Football fans will recognize this one. 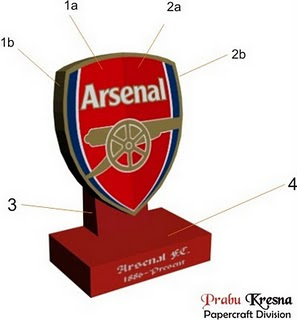 It is the emblem of Arsenal Football Club, an English professional football club based in Holloway, North London and is considered one of the most successful clubs in English football, having won 13 First Division and Premier League titles and 10 FA Cups.